We have a little playground 2 blocks from home. 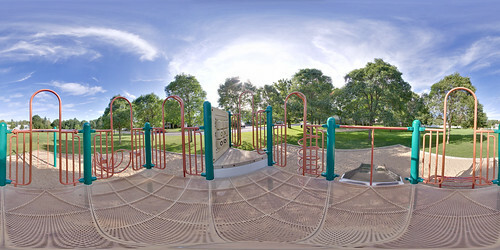 Swings, soccer field, and a big metal structure with slide, little climbing wall and other cool things. Since I go there on a regular basis with the kids, and that my camera follows me, I tried to do it handheld on a few occasions, but the stitch was always awful. So one time, I brought the tripod, and did it properly. Next time I take something like this, I'll need to have the kids in it. 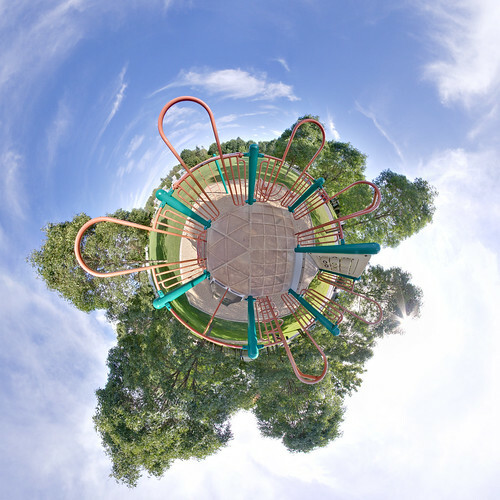 And the little planet that goes with it! One day while on vacation at Tadoussac, after the kids were gone to bed, I grabbed my stuff and went to see what could be a nice picture. I always liked long exposures, and water reflections. So I went on the beach and took a series of pictures of the harbor. I was afraid that the long exposure would make all the boats blurry, but the waves decided to cooperate. Just left of the last boat, the series of light on the shore seem to be Riviere-Du-Loup. I didn't expect to catch this since the St-Laurence River is about 20 km wide at this point. Last summer vacation, we went to see the whales at Tadoussac. The morning before the boat trip (or should I say the planned boat trip since the shuttle "forgot" to come and get us and we had to reschedule...) we went to see the sand dunes. The kids and nani were playing in the sand, up in the dune. I walked down. Actually, I ran all the way down. The sand just softens every step (and slows down any attempt to go back up...). I took 2 pano down, and one halfway going back up (a.k.a. I'm in shape and could have gone back up without stopping, but halfway was sooooooo nice I had to stop for pictures). This is the only one I processed so far. It was taken from one end of the dunes, where there were plenty of rocks. Though this would be a nicer background. 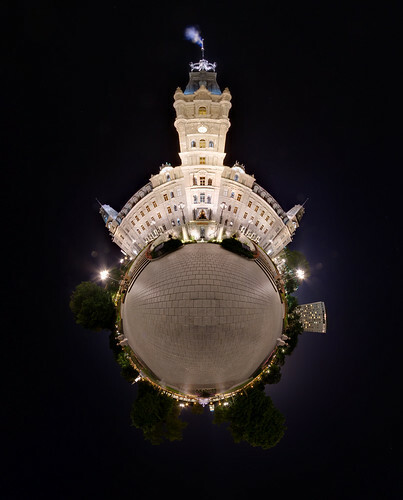 Made 3 stereographic with this one. 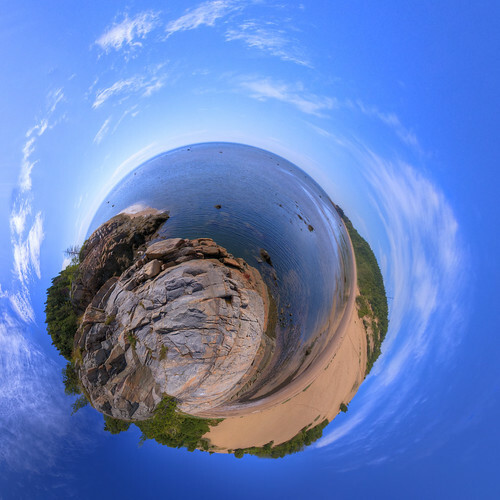 This one is a Waterworld style planet. The next 2 are quite similar, but in one I liked the sun, and in the other I liked the clouds circling the planet. Couldn't decide, so kept both. In August, I was wandering in old Quebec city taking photos and panos. This came out as my favorite (yet... still have not processed all of them). 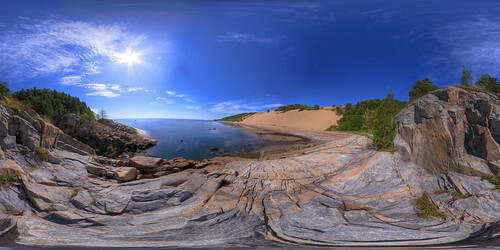 This is a full Equirectangular 360 * 180 projection. It was fully shot at 10mm. It required 16 images * 3 exposures each. I also need a nadir (i.e. the picture of where the tripod was) but did a bad job this time (and every shot this evening... changed technique afterward). So the only solution was to use the brick and pavement tool in photoshop to rebuild the little square that was missing in the bottom. The most complicated of shooting this one was that it was a nice day outside in the end of the tourists season. So I had to way for groups to pass by. Even so, I do have a few ghosts in the picture in it's original resolution. At this size, quite difficult to see. 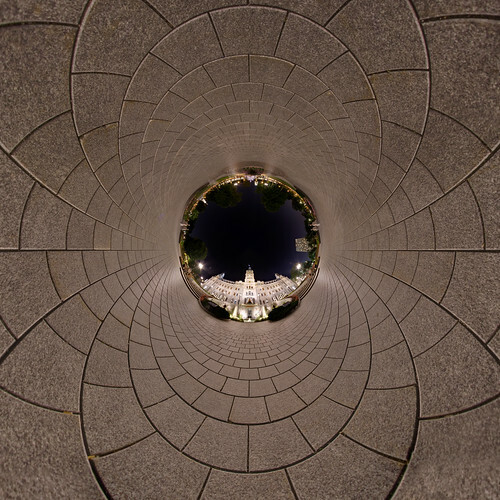 From this one (once the pavement was finished), I had fun with stereographic projections. 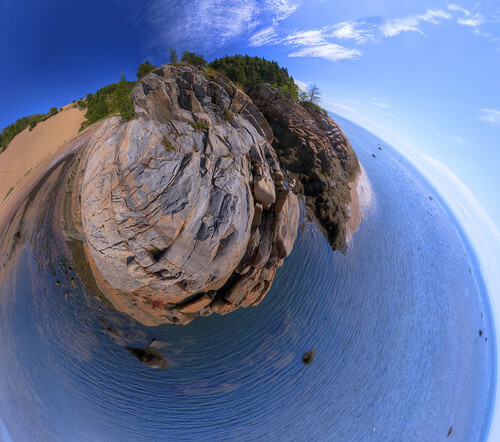 A classic planetoid. When shooting the pano, this was my objective and I like it. I was surprised of this one; I like the symmetrical kaleidoscope style image. But the last one is kind of the best. Nothing like a crooked Parliament to represent reality. 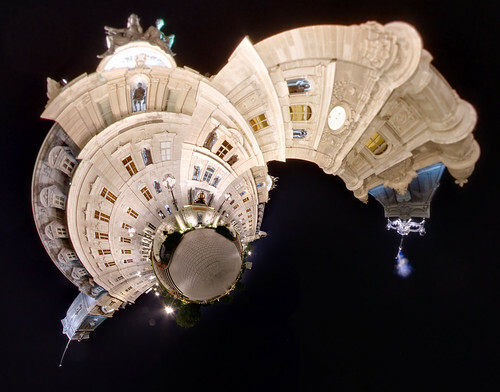 I'll need to reshoot this pano to get a higher resolution because this version is stretched beyond it's original resolution. 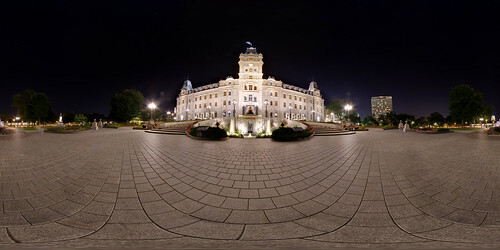 I din't plan on taking any pano, so I only had my camera, and a 17-55 lens (I usually take my pano at 10mm). I decided to try one handheld. 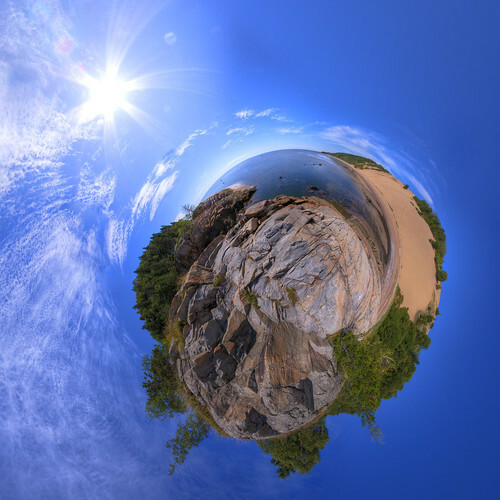 Well, it took 34 Images to cover a little more than half a sphere (I did no shoot the whole sky). 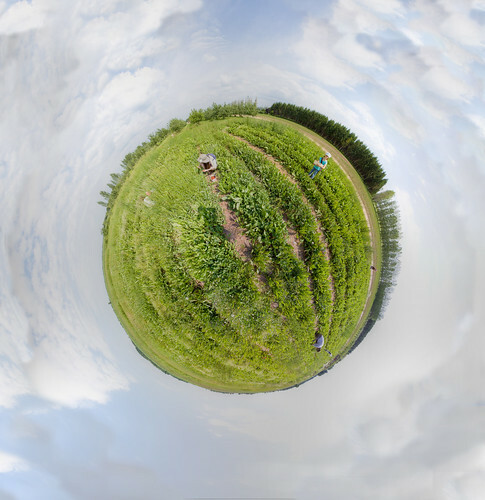 Being handheld, stitching was not perfect, but at this resolution, you cannot see the few plants that ended up blurry.